The Crowd4Africa project was conceived by parents and students at a Catholic school in Rome who wanted to help the Corti Foundation, which supports St. Mary’s Lacor Hospital in northern Uganda. As explained in a post on the Enel site, their idea is to keep bottle caps, cans and plastic containers out of landfills and instead recycle and transform into spare parts and prostheses for the hospital using 3D printers. According to the World Health Organization, more than 20 million people in the world need orthopedic prostheses, but just 2% of them are fortunate enough to receive one. In Uganda alone, 200,000 children are waiting for one. The best solution, recommended by the United Nations, is to make them on site with 3D printers, eliminating the cost of transport and reducing the waiting and production time as well as the cost. To help make that possible, 360 solar panels donated by Enel, a multinational energy company, are contributing to the self-production of power needed by the hospital to operate. St. Mary's treats 290,000 patients annually; 80% of them are women and children. Using 3D printers for prostheses isn't, of course, the only medical application. ABC tells of an engineer in Nepal who is using 3D printers to create medical devices – for clinics in remote areas where sourcing equipment can be difficult. One example: the otoscopes used to check patients for ear infections. Another example comes from the GE Reports site and the story of a Brazilian doctor who uses 3D printing to help blind parents feel their baby's ultrasound. Dr. Heron Werner is able to create lifelike models of the fetus from images obtained by a GE ultrasound machine. GE's ultrasound system, Voluson E10, has built-in 3D printing capability, which allows doctors to help parents better understand congenital defects such as cleft lips. In Cambodia, a former ordnance disposal technician with the US military is using 3D printing to prevent loss of limbs and lives. As a story on the IRIN site explains, "not only in active war zones but in post-conflict countries like Cambodia, decades of strife has left the land riddled with unexploded ordnance, or UXO." In Cambodia alone, IRIN says, UXO has killed more than 60,000 people since 1979. In a factory in Phnom Penh, Allen Tan has several 3D printers producing replica munitions from the same type of plastic used for Legos. The idea is to transform how demining technicians are trained. With the models Tan creates they can see how the bombs and fuses work and better understand how to disable and destroy them. The UN and Red Cross are among those who use them. Medical devices and munitions are relatively small – but there are increasing examples of 3D printing taking on big tasks. Like a house, or even an apartment building. As cities around the world struggle to supply enough affordable housing to meet demand, 3D printing may be a solution. 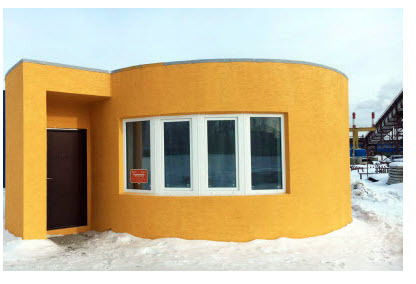 The UK Telegraph reports on Apis Cor, a 3D printing company based in Russia and San Francisco that says it built a house in Russia in 24 hours using an on-site, mobile printer. According to the company the house, which cost just $10,134 to build, can last up to 175 years. "We want to help people around the world to improve their living conditions," company founder Nikita Chen-yun-tai said in the Telegraph piece. "That’s why the construction process needs to become fast, efficient and high-quality as well. For this to happen we need to delegate all the hard work to smart machines." The Chinese company WinSun, which reportedly printed 10 complete houses in a single day, revealed in 2015 that it had 3D printed an entire five-story apartment building and an 11,840 square foot villa. The process WinSun uses, according to a CNET article, can save 30% to 60% of construction waste and reduce production time 50% to 70%. Labor costs drop between 50% and 80%. That 11,840 square foot villa cost about $161,000 to build. But there are differences of opinion in the industry about how 3D printing will play out. As Jason Spiller, founder of Formwurx, a UK 3D printing startup, told ICAS.com: "My personal thoughts are that additive manufacturing will become a very real phenomenon in the construction workplace, but not using massive machines extruding concrete." Rather, he suggests, "it will be a melding of smart materials, swarm robotics and some form of AI to create teams of cat-sized robots, probably insect-like in appearance which work like an ant colony."